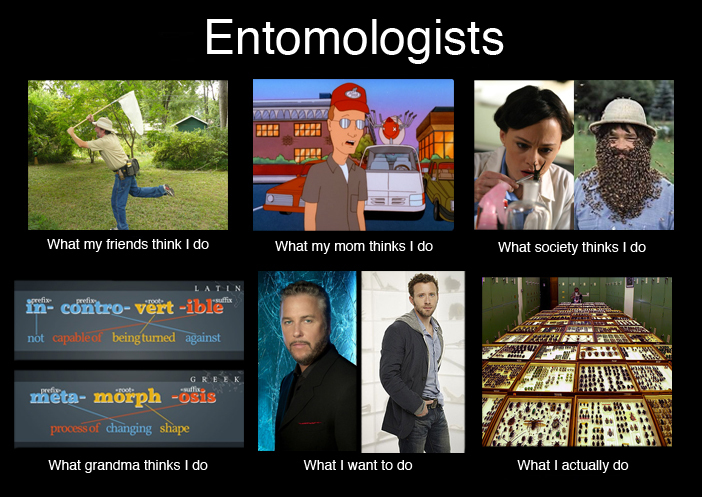 Entomologists are people who study insects. All over the world, entomologists observe, collect, rear and experiment with insects. Research undertaken by entomologists covers all biological disciplines such as evolution, ecology, behavior, anatomy and physiology, to biochemistry and genetics. Many biologists work with insects because they are easy to culture, many individuals are available, and there is a diversity of species to study. We study insects for many reasons. Their ecologies are incredibly variable. Insects may dominate food chains and food webs in volume and numbers. Feeding specializations of different insect groups include detritus, rotting materials, living and dead wood, and fungus, aquatic filter feeding and grazing, herbivory, predation and parasitism. Insect may live in water, on land or in soil throughout, or during part of their lives. Their lifestyles may be either solitary, gregarious, subsocial, or highly social. They may be conspicuous, mimics of other objects, or concealed, and may be active by day or night. Insect life cycles allow survival under a wide range of conditions, such as extremes of heat and cold, wet and dry, and unpredictable climates. Insects are essential in ecosystems in many ways: as nutrient recyclers, in plant propagation, including pollination, seed dispersal, and in maintaining plant community structure; as food for insectivorous birds, mammals, amphibians, reptiles and fish; and in maintaining animal and plant community structure, through disease transmission, and herbivory, predation and parasitism, and in forensics.